Many people set off on a walk relying on a route described in a book/newspaper. There are hundreds of books on the market describing all manner of walks from easy to difficult, linear to circular. Many, such as the famous ones by A W Wainwright, have exquisite drawings or photographs. Some have a mass of information about the history of the area, flora, fauna etc. The problem is that the authors may have walked the routes navigating with a map, possibly not made notes at the time but written the description afterwards or simply known the route so well that the directions for anyone else are lacking in sufficient detail. Some articles/books make you wonder if the authors have ever walked the route at all! As an example, you may be told to turn left at a stream. BUT, there seem to be 2 streams. Did the author mean the first or the second? Rights and lefts have been known to be confused. Many books have one thing in common, used in isolation, they will in all probability get you lost! Being lost could be dangerous and at best will leave you frustrated or cause arguments. Also, if you are caught by bad weather, you will cease to care very much about the historical or natural facts and want efficient directions to the conclusion to the walk. You will not want to get bogged down (maybe literally!) in the verbiage. The books are great for getting the ideas but the most secure and most efficient way of finding your way is to relate the instructions in the book to an Ordnance Survey map. Work out in advance on the map where the route goes then use the map for guidance in conjunction with a compass if necessary. By all means take the book for additional information if you wish but do not use it as your primary reference. For even greater certainty and if you have splashed out, a GPS receiver or GPS facility on a smartphone can offer spectacularly accurate wayfinding if used intelligently. However you should still take a map and compass and know how to use them. Batteries might fail! So let us take this in easy stages. One of the biggest mysteries of walking is often perceived to be use of the compass. It is not rocket science and is actually really simple. 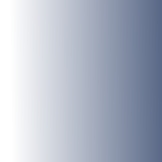 A full description of how to use a compass is given in the Using A Compass page. The type you want consists of a transparent baseplate on which is a transparent compass which turns. The compass should have parallel lines across its base. A magnifying glass is usually included. The most basic compass which fits this description will suffice for most walking. It is not necessary to buy a Rolls Royce version. For the UK, Ordnance Survey maps are invaluable. Buy the 1:25000 scale. The 1:50000 maps do show most footpaths but far more detail is on the 1:25000 range. More advice on this subject is on the Ordnance Survey Maps page. See the full range of 1:25000 maps. People often think OS maps are expensive but bear in mind that each one can provide a myriad of routes. If each map gives you half a dozen walks (and they will give considerably more if you look after them) the cost per walk is well under the cost of half a pint of beer which you would no doubt not think twice about. Get a map case in which to put the map. Two reasons for this. If folded to show the right section for your walk, once in the case, you will not be constantly folding/unfolding - which will wear it out. The case will also protect from the rain. A simple cheap plastic transparent case is not expensive though may crack after a time. They also have a weak spot where a simple Velcro strip fastens. A superior map cases is produced by Ortleib which feels like a transparent rubber type material and with a wrap over seal guaranteed waterproof. Avoid the map cases which are plastic one side and a fabric the other. These tend to let in water. An alternative is to get plastic laminated maps but these are much more expensive than the paper ones. The ultimate navigational aid is the GPS receiver. Garmin are probably the best known manufactures. These are relatively expensive items. They are extremely useful but by no means essential. Certainly, do not buy one until you have done some walking and decided you want to continue with the pastime. Some modern mobile phones also have a GPS facility. If you have a smartphone, check out Viewranger to see if you can install a GPS mapping application. They provide a fully featured GPS app for which you can get Ordnance Survey mapping. In the field, a variety of signs help you find your way. 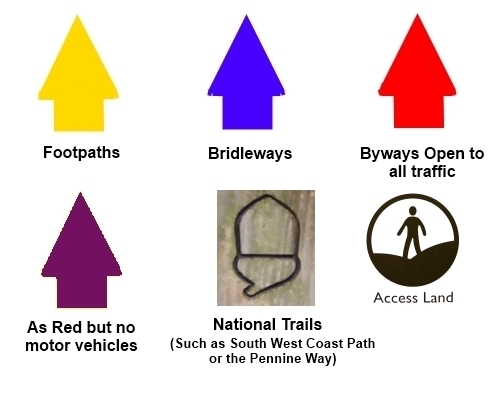 The nationally recognised ones are below although other colours do crop up, often a local route devised by a local authority or organisation. Visit the Happy Hiker (in Association with Amazon) Hiking Store to buy navigational equipment and Ordnance Survey maps.